PRESS RELEASE: Product specialist and brand ambassador Dr Epiphone embarks on his inaugural UK in store clinic tour at various Epiphone dealers. Will Jones AKA Dr Epiphone product specialist and brand ambassador for Epiphone will represent and inform customers at key UK Epiphone dealers the features and advantages, the rich history and superior quality of all Epiphone products, as well as the fun and life-enriching experience of self-expression through music. This will be Dr Epiphone first UK in store clinic and it promises to be a lively and informative event. A list of dealers and tour dates are listed below. Check the dealers own website for Dr Epiphone Clinic times and further event details. 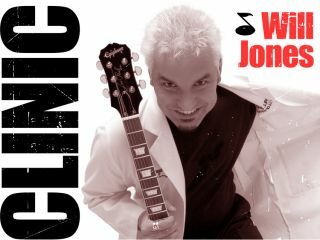 While at Epiphone, Will Jones has performed as an integral member of the Epidemics in Nashville, Los Angeles and Germany, lead singer and rhythm guitarist of the Dr. Epiphone band in Japan, China, Australia, New Zealand, Canada and the United States. He has also performed guest lead vocals for rock legends Twisted Sister on multiple occasions. Dr Epiphone also hosts a weekly music spotlight radio show called Eclectica, which features music and live interviews from artists and songwriters from every genre of music. The show is heard worldwide every Friday night at 10pm CST at Nashvilleradio.biz. Will also authors an advice column for musicians and singers called "Ask Dr. Epiphone" in Singer and Musician magazine, a national bi-monthly publication.